If you’re looking for a way to add more vegetables to your diet, give this recipe for spinach a try. It’s delicious and the left-overs (if there are any) are great too. If you stick your nose up at spinach and say “no way, never!” then think again. I was the same way, until I tried this recipe. Visions of warmed canned spinach, swimming on my plate as a child still haunts me to this day. I’ve learned over the years that spinach has gotten a bad rap. Scalloped is a French term that basically means to prepare a food, most notably potatoes, by layering slices with cream or a creamy sauce in a casserole dish. 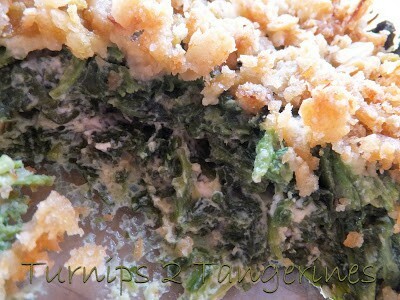 Then topped with a bread or cracker crumb topping before being baked. Scalloped spinach is a mixture of frozen spinach, eggs, heavy cream, blue cheese, onions and spices. The topping is a mixture of cracker crumbs and french fried onion rings. Sounds good, doesn’t it! Popeye’s addiction to this “power packed” vegetable comes from the fact that it’s a rich source of iron as well as vitamins A and C. Fresh spinach is available year-round and is now available pre-washed as well. Choose leaves that are crisp and dark green with a nice fresh fragrance. Avoid spinach that is limp, damaged or discolored. Refrigerate in a plastic bag for up to 3 days. 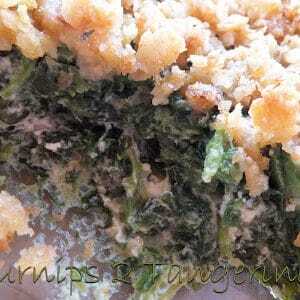 Frozen spinach is often used in dips and casseroles. *Scalloped Spinach is the perfect side-dish to serve alongside Roasted Chicken in a Cast Iron Skillet. Scalloped Spinach makes an excellent side dish to any Sunday pot roast or roasted chicken dinner. In a large bowl, combine the spinach, eggs, milk, cheese, onion, salt, pepper, and nutmeg. Spoon into a greased 1-1/2 to 2 quart round glass baking dish. Bake at 350º for 50 minutes. In a small bowl, combine cracker crumbs, french fried onions and melted butter. Sprinkle over top of spinach mixture. Bake 10 to 15 minutes more or until a knife inserted 1 inch in the center comes out clean.